09-Aug-2001 -- Having just come from our last two successful visits at N50° W107° and N52° W108° we headed off to our third one of the day. From Biggar we headed west along Highway 51 towards Kerrobert. We turned north onto Highway 659 and after about 6.5 km came to a grid road that would lead us to the confluence point. It was quite apparent that this one would once again be another typical Saskatchewan confluence point ... flat prairie and a farmer's field. One and a half kilometers west then about 310 m north on a second grid road brought us to within 178 m west of the confluence. We parked the van on the side of the road and headed out on foot. We both remarked what a difference this field of wheat was in comparison to the one we had been in at N51° W102°. There the wheat was at least waist high while here it barely came up to our knees. The ground was extremely dry and in several places we noticed deep cracks in the soil. 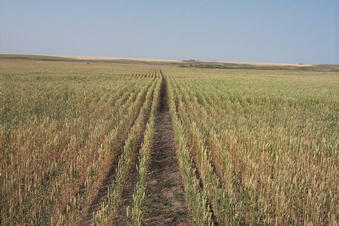 This is not going to go down as a record crop year for farmers in the west side of the province. Once again the drought was taking its toll. Although the mosquitoes were not quite as bad as we had experienced at our previous visit to N52° W108° we did find that the field was alive with grasshoppers. If the drought wasn't bad enough for the farmers to contend with they also had the grasshoppers to deal with. They were managing to destroy what little crop there was. After taking the required photos we looked around the area to find something a little more interesting to photograph. We did find a pretty little valley just 800 m north and took a few pictures there. Too bad the confluence point wasn't situated there! It was now 6:00 and time to call it a day. We headed west, passing through Kerrobert where a couple of other photo opportunities presented themselves. Our plans called for an overnight stop in Lloydminster ... the only city in Canada that exists in two provinces. We had at least another 200 km to drive before we could call it a day. Supper was definitely going to be late tonight! #1: Looking north from the confluence point towards a small valley in the distance. #4: The van on the road west of the confluence. #5: The GPS showing "the spot". #7: Looking down the road to the valley mentioned in picture #1. #9: The Graduates of 2001 "graffiti barn" just outside of Kerrobert.